I seem to have spent a ton of money on food in May, so reckon I need to spend June eating the contents of the cupboards, fridge and freezer. Perhaps it was a reaction to finishing Live Below the Line, or becoming all sociable and having people to stay, or maybe the lure of 25% off offers and discount vouchers tempting me to stock up on wine. On the plus side, I do now have quite a lot of food lurking in my cupboards, and almost overflowing from the freezer. So I think it’s about time we actually ate some of the food we already have, rather than buying loads more. We will need some extra fresh stuff, like fruit, veg and milk, so I’m intending to use a Morrisons voucher for £6 off when spending £40, and the challenge will be to see how long we can then stagger through June. I therefore spent a chunk of this morning doing a stock check, and making a list of all the food in the house. It’s something I do from time to time, to work out what gaps need filling, and perhaps more importantly what needs using up. Forgotten ingredients will inspire me to try recipes we haven’t eaten for ages, or search for recipes where I’m lacking inspiration. If you’re strapped for cash, a stock check will help you work out meals based on what you have, so you only need to buy top up ingredients. When doing a stock take, I go through the kitchen shelf by shelf, putting the food on a tray and then replacing it once I’ve written it on the list. 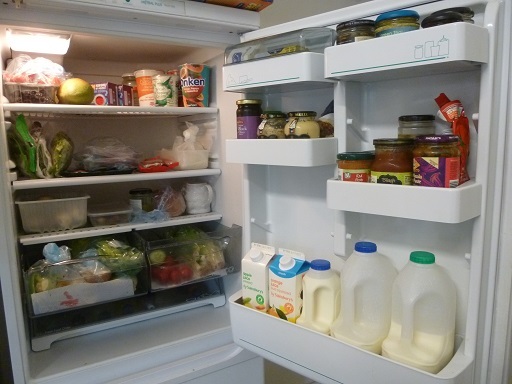 I do the same thing for the fridge and freezer, shutting the door while I do each shelf or drawer to keep the cold in. It’s a good chance to wipe down the shelves, removing any spills or sticky patches as I go along (golden syrup, I’m looking at you). In the process I discover leftovers that need using up, and leftovers that are now so far gone they can only go in the bin. It reminded me to freeze ingredients like short-dated cream that won’t get used before they go over. I also discovered the missing jar of mango chutney (but only after buying a replacement) and marvelled at how I’d ended up with quite so many tins of tomatoes, porridge oats and different kinds of flour. If you’re on a tight budget, a regular stock take will help avoid buying duplicates of food you already have. 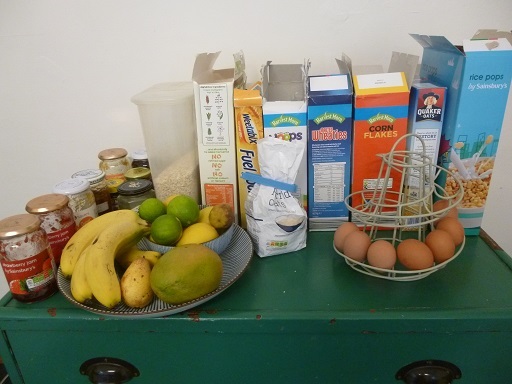 So just in case anyone else is also curious about the contents of kitchen cupboards (and I’m willing to acknowledge it might be a small field), I took some photos of my own kitchen on the last day of May. Bottom right is a carb-fest of pasta, noodles, rice, cous cous and so on. Middle left is tin city and middle right is baking ingredients like flour and sugar. The top almost unreachable shelves have dried stuff like lentils, split peas and nuts on the left and fancy baking stuff on the right. 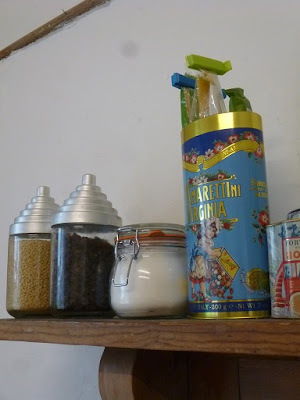 Cake sprinkles and cooking chocolate are stashed in the silver tin, in a an attempt to stop the younger generation mountaineering up the worktop in search of sweets. The “big fridge”. Just don’t tell it about the mahoosive American ones. Dairy products and berries at the top (again the logic is all about keeping small children away from the food they covet the most), then herbs, cooked meat and cheese in the middle, veg and leftovers on the bottom shelf, salad veg in the drawers and bottles of water in the slidey bit at the bottom. Milk, fruit juice, butter and assorted jars live in the door. 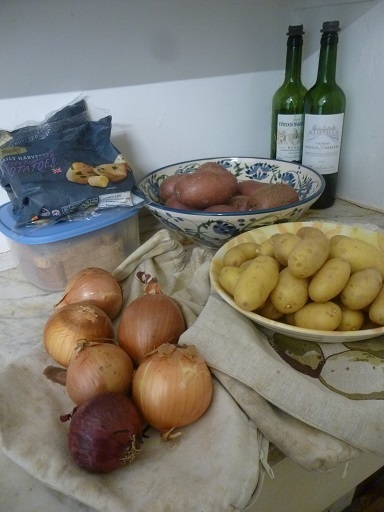 Top drawer is frozen veg, frozen fruit and boxes of long forgotten leftovers. Some bread rolls have snuck in there too. Bottom drawer is meat, fish and cheese. 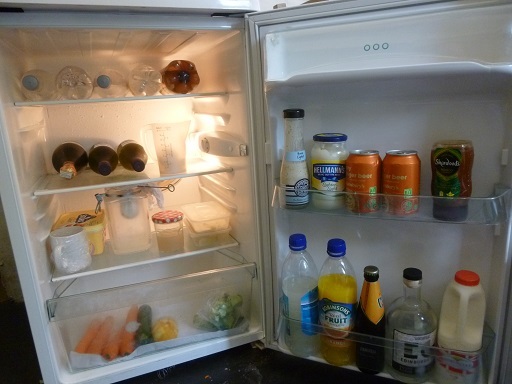 It’s mostly drinks, plus any extra leftovers and veg that won’t fit in the big fridge. There’s even some yogurt cheese in process on the shelf above the veg drawer. Economic decline in one set of spices. Live Below the Line definitely made me realise that if you can afford to invest in some herbs, spices and other flavours, you can make basic ingredients taste a million times better. Shedloads of oats. Ideas other than porridge, pancakes and flapjack gratefully received. Tins of teabags ahoy. And coffee, if you’re that way inclined. 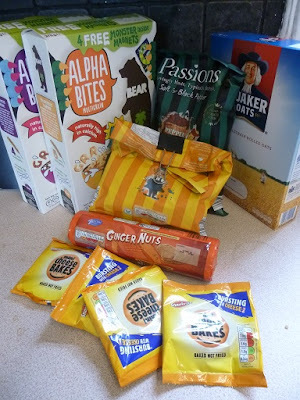 The secret stash of crisps, biscuits and the cereal with highly desirable monster magnets. So all in all, looks like we do have quite a lot of food to feed a family of four. 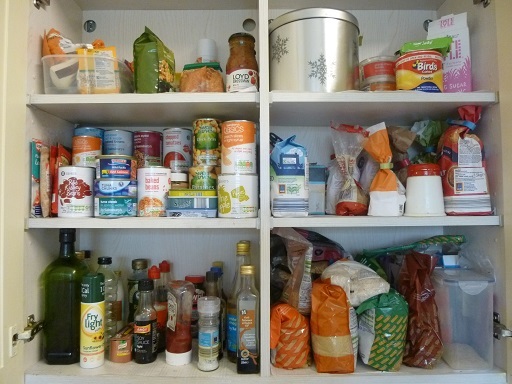 What do your cupboard looks like? Along Mother Hubbard lines, or enough to stock a small supermarket? Next step: meal plan and shopping list. My cupboards look very similar …. only there's more of them. 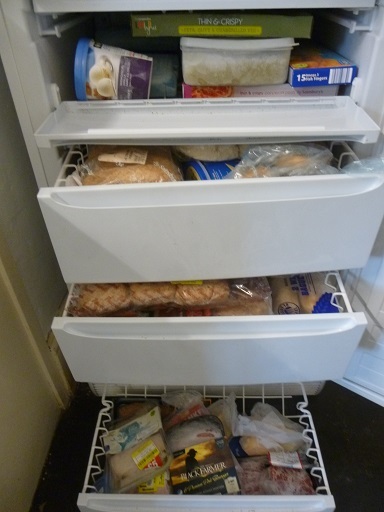 I also have a large American style fridge freezer which is pretty full and a huge chest freezer which is almost full. I need to do s similar stocktake I think and start running supplies down. The Live Below the Line challenge does make you look at things with fresh, and very grateful eyes doesn't it. Yes! 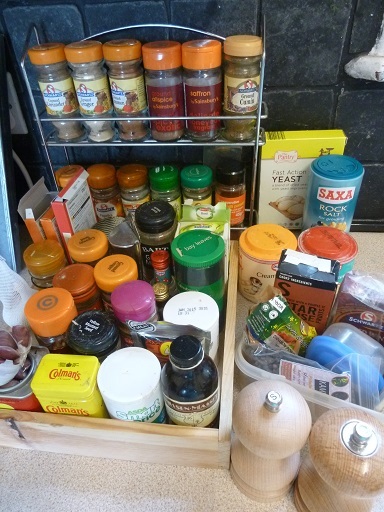 Storecupboard challenge! Glad it's not just me looking at their kitchen and realising they have quite a lot of supplies. After Live Below the Line it almost feels wrong to have so much. At least I can do my best to use up leftovers and cut down on any food waste. 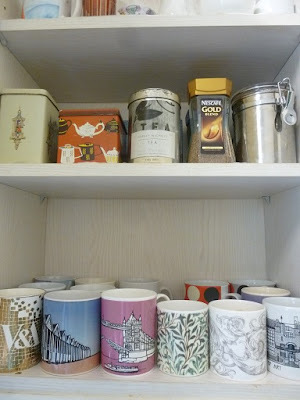 My cupboards and fridge are also well stocked. I try to do a stock take every month and meal plan my way through the stock as we go along. Sometimes I am very good at it and sometimes I get to lazy. I will do my stock take tomorrow…. I am in on the store cupboard challenge.